How can I work for Bristol Energy? If you are interested in working for us check out our vacancies at ‘Join our team’. Yes. We're pleased to offer the Warm Home Discount. Click here to find out more. Are we providing all council tenants with Bristol Energy? We'd be delighted to supply council tenants with electricity, gas or dual fuel. As long as you are the bill payer, you can switch easily to Bristol Energy. Will we buy electricity from nuclear sources? Whilst we will not seek to directly purchase electricity from nuclear generators, the electricity supply of the UK does include generation from nuclear sources. Currently our fuel mix is grid average and this will include nuclear power in the mix. Are you a green energy supplier? Our overall fuel mix for 2017/18 was 51% green, significantly higher than the UK grid average of 29%. We also offer our My Green Plus tariff, which is backed by 100% renewable electricity that we purchase directly from independent generators across the UK, from local businesses to farmers and community energy projects up and down the country. The plan also offers 15% green gas, produced from sewage waste in Bristol! Find out more about our poo-powered gas. Is it just for Bristol? Anyone in Great Britain can become a customer and help Bristol Energy achieve our social objectives. How will the profits be used by Bristol Energy? Profits from Bristol Energy will be reinvested into Bristol, and likely to include local sustainable energy projects and council service priorities. What is a Municipal Energy Initiative? A Municipal Energy Initiative is an energy project that is being run by a local authority, in this case Bristol City Council. In Bristol the company is a key legacy from its year as European Green Capital. How is Bristol Energy different to other suppliers? Bristol Energy is owned by Bristol City Council and we will generate an income that will go back into the city. We will champion renewable energy projects in the community and ensure fair prices for those who spend more than they can afford on fuel bills. How can I find out more information about prepayment tariffs? Please contact the customer care team on 0808 281 22 22 or email us: [email protected]. Or check out our info on our range of tariffs. Can you supply my business? Yes, we will be offering gas and electricty supply services to business customers across the UK from Spring 2016. You can register your interest in becoming a Bristol Energy business customer here. Do you offer smart meters? We’re currently installing some 1st generation meters SMETS1 to those that will benefit most, as we can do this sooner. We’ll then be installing 2nd generation smart meters SMETS2 for almost all homes and small business customers when the technology is ready. By mid 2019 we aim for our SMETS2 roll out to speed up and to be installing thousands of meters, and the benefits they bring, per month. Find out more about smart meters. What if I have an outstanding bill with my current supplier? If you have an outstanding bill you are still able to switch to us. You will be sent a final bill from your current supplier. If you are on a prepayment meter with an outstanding bill of up to £500 then we'll consider how you will be able to pay this bill to us, as part of your outstanding payments. It will normally take up to three weeks to switch from the date you sign up to Bristol Energy. This includes your 14 day ‘cooling-off’ period. Will you take Bristol pounds? 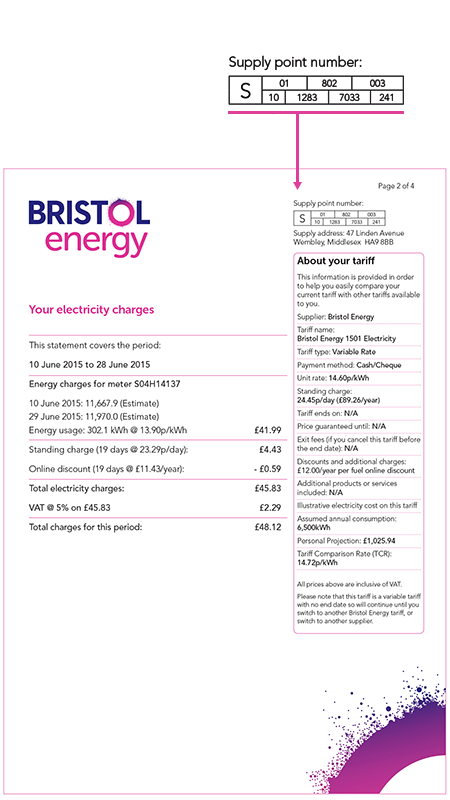 Yes, you can pay your Bristol Energy bill in Bristol Pounds. Find out more information about paying with Bristol Pounds. I’m on prepayment – can I join Bristol Energy? Yes. We offer our Prepayment (PAYG) Standard Variable Tariff, which is reviewed and updated regularly as wholesale energy prices change. We are committed to making sure customers on prepayment meters aren’t trapped on expensive tariffs – and don’t pay any hidden costs. Please speak to our customer care team to find out how much you will pay. Do I need to buy both electricity and gas from you? You can choose to be dual fuel (electricity and gas) or just electricity or gas, depending on what suits you. Will I need to submit monthly meter readings? We will need a reading from you when it is near your switch date. Once you are a customer you can submit readings online to help keep your bills accurate. Get a quote online now, phone us for free on 0808 1894072 (Mon-Fri 8am-5.30pm), or drop us a line at [email protected]. Choose your tariff and method of payment and confirm your switch to us. We’ll handle the rest. Bristol Energy is an electricity and gas supplier that is built on fairness and equality. We believe that everyone should benefit from fair and transparent tariffs, great customer service and the reinvesting of the money we make back into local communities. We’ll support new technology to help you use less fuel and will invest in low-carbon innovations to support local renewable energy projects. What is my supply point number? The supply point number given is used to help energy companies complete the switching process and for the companies that distribute your electricity or gas (local network operators) to identify you. For electricity this is called a Meter Point Adminstration Number (MPAN) or for gas a Meter Point Reference Number (MPRN). The first number on the bottom line identifies which network distribution supply region you are in - this is also stated on your bill under the emergency numbers. You can use Meter Point Administration’s online service Find My Supplier to find details of your gas supplier. They can also provide your Meter Point Reference Number (MPRN). Do prepayment customers receive bills? Prepayment customers won’t be billed monthly, however you will receive an annual statement summarising your yearly usage. Find out more about our services for prepayment customers. What happens if I run out of credit on my prepayment meter? You can use the emergency credit which is £5, and can re-pay this when you next top up. Emergency credit is there to support you when you can’t access a local PayPoint or Payzone, if your meter runs out in the middle of the night, or you can’t leave your home for any reason, and should be used as a last resort. Please also call or email the customer care team, so we can talk to you about your situation, and make sure you have the energy you need. If you need help with managing your payments or some energy saving advice talk to our specialist Bristol based team. We are currently available Monday to Friday from 9am to 5pm. If you have an emergency with your gas or electricity supply, for example you can smell gas, visit our emergency numbers contacts. How can I find out how my bill is calculated? Your tariff information includes information on your unit rate, any standing charges and if you have an exit fee. This will help show how your bill is calculated. We buy electricity and gas on the wholesale markets and will always pass on any drop in prices to our customers. Your payment method will determine when you receive your electricity and gas bills, or a statement of your account if you are paying by monthly Direct Debit. Is there a discount for paperless billing? Yes, we offer a discount for paperless billing and details of this is included within our tariffs when you obtain a quote from us. Can I look after my account entirely online? You can manage your electricity and gas bills, meter reads and much more in our secure customer portal. You can access your account here. How do I contact the Bristol Energy customer care team? By phone: You can call us free on 0808 281 2222. We are available Monday to Friday from 8am to 6pm. Write to us at: Bristol Energy, 100 Temple Street, Bristol BS1 6AG. I’m a landlord – should I tell you about new tenants? If you are a landlord and pay the energy bills, and will continue to do so, we do not need to be notified of a change of tenancy. If your tenants pay the bills and their names are in the contract with us we need them to tell us at least five working days before moving and to provide final meter reads. How do I arrange paperless billing? To qualify for a paperless billing discount of £12 per year, please ring our customer care team free on 0808 281 2222. You’ll need an email address to do qualify for this. I would prefer a bill that uses my meter reads rather than estimates. If you provide regular and accurate meter reads this should be reflected in your bills. As long as we receive the reads ahead of your billing date they should be included. To discuss getting the reads included in your next bill please contact our customer care team free on 0808 281 2222. My bill looks wrong – what should I do? If your bill isn’t what you were expecting please tell us here. Alternatively you can ring our customer care team free on 0808 281 2222 or email us here. Can I change tariffs online? If you wish to review or change your tariff please call our customer care team free on 0808 281 2222 and they will find the best option for you. To change your password all you need to do is go to ‘my account’ and change your password details here. You can also do this when you login. If you have forgotten your password, you will be asked to make a new password. If you are moving house please let us know at least 5 days in advance. You can do this by calling our customer care team free on 0808 281 2222 or send an email to us and we'll be happy to help. Don’t forget to take meter readings on the day you move out for your final bills. If you’ve had ongoing problems please call our customer care team free on 0808 281 2222. It may be that you’ve been trying to use a different email address to the one that you registered with us when you joined. They can sort this out for you to make it easier next time. You can request for your bills to go to a different address than the property we are supplying. To do this please ring our customer care team free on 0808 281 2222 or email us here.